Protect your windshield by using this AutoDrive Wiper Blade. It is designed to provide you with high performance during all seasons. It is made to be easy for you to install. 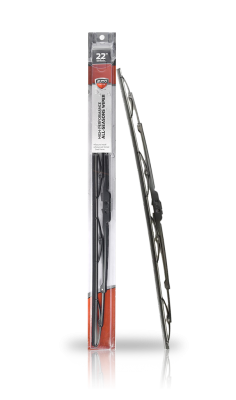 The all seasons wiper blade has an advanced vented steel structure that gives you the best performance available. It comes with an adaptor that fits most vehicles with hooks, pins and bayonet arms. It will make a convenient addition to your vehicle. It will keep you safe and protected during harsh weather. HIGH PERFORMANCE ALL SEASON WIPER. EASY TO INSTALL METAL WIPER WITH METAL BACKED REFILL. INCLUDED ADAPTER FITS MOST VEHICLES. 556891523 - AutoDrive Wiper Blade 26" 556891484 - AutoDrive Wiper Blade 19"